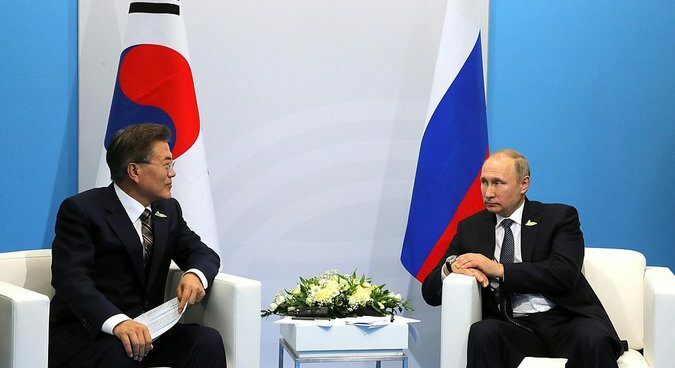 South Korean and Russian Presidents Moon Jae-in and Vladimir Putin on Monday discussed the possibility of cutting off North Korea’s oil supplies as a possible response to the DPRK’s sixth nuclear test. During the phone call, the two leaders discussed possible solutions to the North’s developing nuclear program, with the Russian side urging that all parties return to talks, Russian media reported. “The Russian side once again stressed that this extremely complicated situation can be settled only through the resumption of talks and wide use of political and diplomatic means,” the Kremlin reported, in a statement carried by state news agency TASS. Several commentators have called for restricting the North’s oil supplies following the DPRK’s test, with recent UN resolutions already targeting the majority of DPRK’s high earning exports. Restricting the North’s oil could have a serious impact on the DPRK’s economy as it has no domestic oil supplies of its own, and has traditionally been reliant on Russia and China for its fuel supplies. Without shipments of crude oil and fuel products from China, North Korea would find it difficult to produce fuels for its recently expanded car and vehicle fleet. “How long it takes to be felt by the nonmilitary sectors in the DPRK would depend on how and whether the DPRK chooses to allocate shortages and/or chooses how, when, and where to use oil products that it may (likely does) have in storage,” David Von Hippel, a senior researcher at the Nautilus Institute for Security and Sustainability, told NK News. China has historically shown little interest in restricting the North’s oil supplies, however, and would be able to veto the proposal at the UN Security Council. “So far the response from China (Global Times) has suggested that a ban is not going to happen, although the Chinese are plenty annoyed about the test,” Von Hippel added. Moon and Putin’s discussion of suspending oil shipments to North Korea comes as Russian companies and individuals face U.S. Treasury Department sanctions for providing North Korean with oil products. Washington’s sanctions may have succeeded in temporarily shutting down Russia’s regular supplies of oil products to the North, which were routinely shipped from Vladivostok by a fleet of North Korea-owned tankers. One expert told NK News it was unlikely that Putin would get on board with any efforts to block the supply of oil products to the North. Subscribe to read the remaining 481 words of this article.